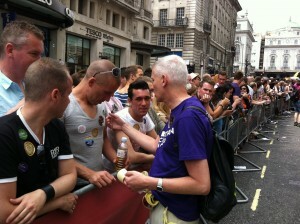 This year’s London Pride is taking the theme (….) and we will be taking the opportunity to celebrate our freedom to be fully both people of faith and LGBTQI people – and to let those who don’t already know it see that, yes, it IS possible to be LGBT and Christian. MCCNL will once again be joining our numbers to the ranks of Christians Together at Pride, both on the march and in the joint service. For details of both, and other events, see below. 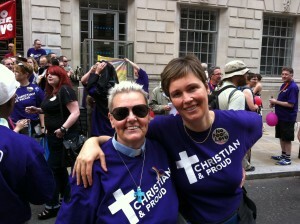 Christians at Pride is a collaboration between many LBGTQI Christian groups and churches, who march together and organise joint events. As events are planned and published, they will be posted up on this page: watch this space. Communion Service at 9am to begin with a blessing before we join the march. 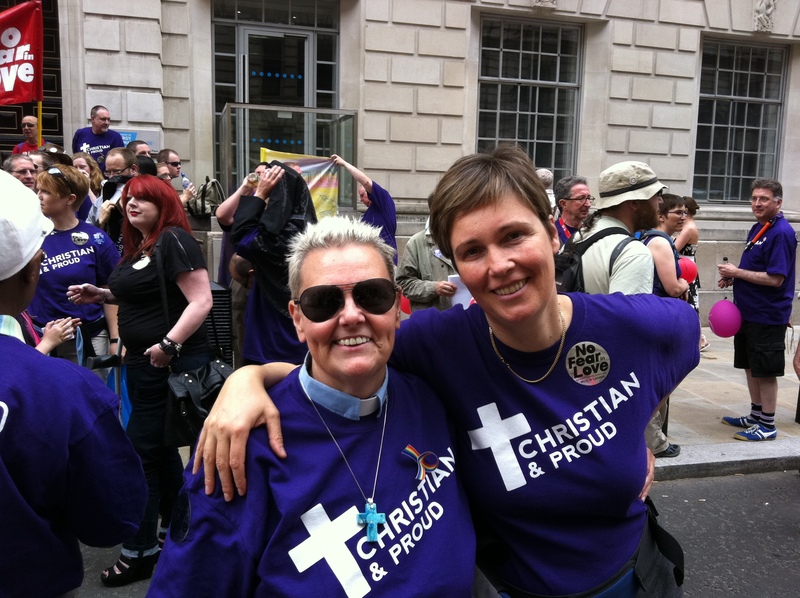 This year the joint Pride Service will be held at St James Picadilly, and the guest speaker will be Rev Rachel Mann, an Anglican priest, poet and feminist theologian, and transgender woman. We will need able-bodied volunteers to help us carry things on the Saturday, and set up for the stall and tent – driving and parking being well-nigh impossible anywhere around the parade route. 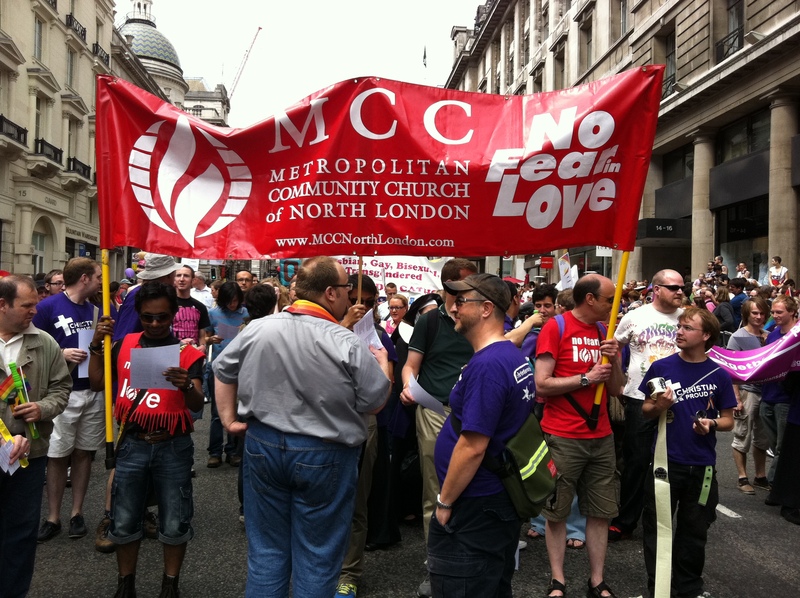 To help with carrying banners etc for the march, please speak to (..), and to assist with carrying and setting up for the stall, contact (…). We continue to celebrate Pride month in our Sunday services all through July, as we explore and express our faith in a God of truly inclusive Love, with a gospel that is good news for the full and wonderful diversity of God’s creation the world over. Come and join us in worship and community. 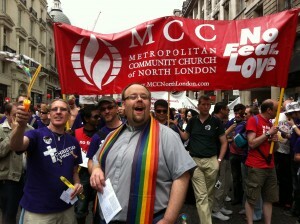 Clergy Intern Neil Jones leading the singing of ‘Yes, Jesus Loves Me’.